I've got a fun little project to share today. This is a cardboard rocket ship that Clark and I made out of some cardboard that we've had stored. Crafting with kids can sometimes be frustrating. I like to keep the crafts simple and quick. We turned this little rocket ship into a birthday card for Clark's Papa. On the back we wrote: "Hope your birthday's a blast". This is could a really fun homemade valentine as well. We gathered up our colorful cardboard, though I really wish we'd used some old cereal or kleenex boxes. This cardboard was a bit too thick for the project. You want it to be thin enough to cut through (especially for little hands), and rigid enough to keep it's shape. 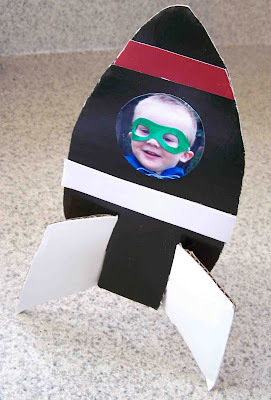 You can find my printable rocket ship template here. 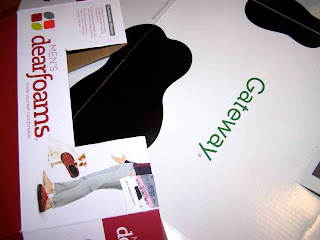 The basic instructions are included on the template. We added a small picture of clark to personalize the rocket a bit, but you could decorate with stickers, markers, glitter, etc. Now have fun crafting with your kids/grandkids. That turned out to be a really cute card! Thanks for sharing!